Ocean currents in the area mean there are naturally low levels of surface water CO2, similar to those that would have been present before the global Industrial Revolution. However, the volcanic seeps indicate how rising CO2 levels will affect future ecology, both in the northwest Pacific Ocean and across the world. Lead author Dr Sylvain Agostini, Associate Professor at the University of Tsukuba Shimoda Marine Research Centre, said: "These CO2 seeps provide a vital window into the future. 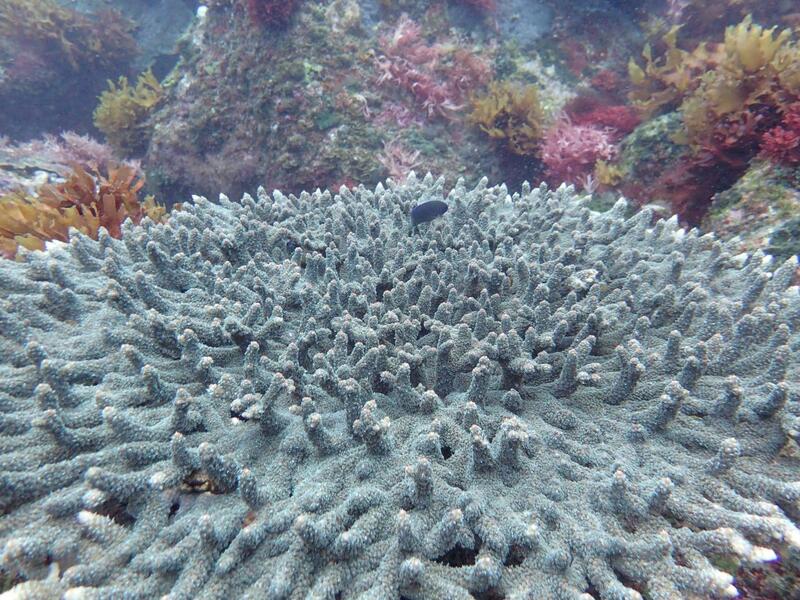 There was mass mortality of corals in the south of Japan last year, but many people cling to the hope that corals will be able to spread north. Therefore it is extremely worrying to find that tropical corals are so vulnerable to ocean acidification, as this will stop them from being able to spread further north and escape the damage caused by water that is too hot for them." Jason Hall-Spencer, Professor of Marine Biology at the University of Plymouth, said: "Our research site is like a time machine. In areas with pre-Industrial levels of CO2 the coast has an impressive amount of calcified organisms such as corals and oysters. But in areas with present-day average levels of surface seawater CO2 we found far fewer corals and other calcified life, and so there was less biodiversity. It shows the extensive damage caused by humans due to CO2 emissions over the past 300 years and unless we can get a grip on reducing CO2 emissions we will undoubtedly see major degradation of coastal systems worldwide." Professor Kazuo Inaba, former director of the Shimoda Marine Research Centre, added: "Local fishermen are keen to know how ocean acidification will affect their livelihoods. Currents flowing past Japan bring waters that have naturally low levels of CO2 and fish benefit from the array of calcified habitats around our islands. If we are able to meet the Paris Agreement targets to limit emissions we should be able to limit further damage to kelp forests, coral reefs and all marine ecosystems."